When Barack Obama was elected president, Governor Blagojevich of Illinois saw opportunity in the vacancy created in the U.S. Senate. "I've got this thing and it's f------ golden, and uh, uh, I'm just not giving it up for f------ nothing," he allegedly said, according to U.S. Atty. Patrick Fitzgerald of Chicago. Fitzgerald has the governor's recorded conversations demanding $500,000 to a million dollars to sell the senate seat. How ironic! The governor of a major American state that is sending its senator to the White House as president got charged with massive corruption on Dec 9, 2008, the day designated as International Anti-Corruption Day by the United Nations. This latest corruption scandal in the United States confirms that corruption exists in all parts of the world to varying degrees, including the industrialized world. However, this report also illustrates that, unlike Pakistan and many other less developed countries, there is greater accountability in the West for the people in power. Official corruption is almost universal but the extent of corruption and the strength of anti-corruption enforcement measures vary widely. It is not the constitution or the laws on the books that make a difference; it's the independence of the career civil servants and the judiciary that differentiates the US system from what is observed in Pakistan and other developing nations. The US attorneys, for example, pursue investigations and prosecutions independently of the politicians who appoint them. The judges are appointed for life and they do not take dictation from politicians and their appointees either. At the time of the recent India-US nuclear deal approval, members of India's parliament, including convicts released on parole, were offered all kinds of incentives to vote in a certain way. Both the government and the opposition tried desperately to entice them with promises of largess, influence and plum jobs in return for their vote. The BJP opposition, however, could not match the resources of the governing Congress party and the deal was approved. There have been significant bribery allegations involving Indian politicians and officials and corporations such as Bofors, Enron and Xerox. The Swedish firm Bofors AB allegedly paid Rs.640 million ($13 million) in bribes to middlemen to get the contracts for the deal signed in 1986. Nearly a decade later, Enron India spent US$ 20 million in "educating" Indian bureaucrats about the role of private companies in power generation, an euphemism for bribes. Two telecommunications companies, Essar and Swisscom, were alleged to have paid a former minister, Sukh Ram, a hefty amount during early 1996 to help change the original license conditions, which it had signed with the Department of Telecommunications. Except Bofors, none have been prosecuted to any extent. Meanwhile, India's spending on defense procurement and infrastructure spending involving foreign companies has increased several fold without much scrutiny of how the deals are made. Not only is there lack of accountability in the developing nations, it seems that corrupt politicians such as Pakistan's President Zardari, widely known as Mr. Ten Percent, get rewarded with high offices by the illiterate electorate living in a feudal society, with the assistance of amnesties arranged by the United States. It is what President Bush often describes as "soft bigotry of low expectations" when the West pushes for the pardon of corrupt politicians in countries such as Pakistan, in clear violation of the UN Conventions against Corruption. What is worse, such policies of condoning corruption are pursued in the name of promoting democracy in the third world. The behavior of condoning corruption in the third world extends to the private sector as well, with American and European companies routinely engaging in bribery in Africa, Middle East and Asia. For example, Forbes reported last year on Siemens involvement in bribery in the developing world as follows: "The World Bank is looking at an electrical power plant project in Pakistan concluded in the mid-1990s, which was built and later partially maintained by Siemens and financed by the World Bank. The World Bank is concerned that Siemens' costs for the project may have been overpriced.Siemens is currently engulfed in a slush-fund scandal, in which prosecutors allege that managers siphoned off hundreds of millions of euros in company money to obtain foreign contracts.Siemens' own internal investigation uncovered 420 mln euros in suspicious payments going back to 1999 which may have been made to obtain telecommunications equipment contracts in a range of foreign countries. The Bavarian State Prosecutors office has said the sum is estimated in the triple-digit millions of euros." Subsequent to these reports, Daniel Noa, Siemens' top anti-corruption chief, stepped down after only six months at the company, with little explanation given. There have also been reports from Munich about Siemens pleading guilty to bribing politicians and officials in Nigeria, Russia and Libya. Last month, Siemens said it would take a charge of about 1 billion euros ($1.29 billion) this fiscal year as part of a settlement of bribery investigations by authorities in Germany and the United States.I believe such reports represent only the tip of the iceberg of corruption involving Western multi-nationals and politicians and officials in developing nations. There are definitely laws on the books in the West such as the Foreign Corrupt Practices Act (FCPA) in the United States. Almost all ethics classes taught in the Western management schools and company training courses cover this topic. However, the question is whether these laws are really enforced and how often are the companies held accountable? Or do they simply rely on the foreign governments to report misbehavior? 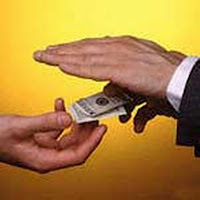 It would be a fantasy to expect the officials and politicians on the receiving end to report incidents of bribery as they are the main beneficiaries. But I think the German, French, US, British and other governments of developed nations who claim higher moral positions should be cracking down on these reprehensible practices just to enforce their own laws and live up to their own higher standards. While it may be argued and it is like putting the shoe on the wrong foot, I see it as the only hope we have of containing such widespread corruption in developing nations that is robbing their people blind. That means Americans also have got some impact of South Asia! Official corruption is almost universal but the extent of corruption and the strength of anti-corruption enforcement measures vary widely. It is not the constitution or the laws on the books that make a difference; it's the independence of the career bureaucrats and the judiciary that differentiates the US/western system from what we see in Pakistan and other developing nations. The US attorneys, for example, pursue investigations and prosecutions independently of the politicians in power or their political appointees. The judges do not take dictation from politicians and their appointees either. I think including Pakistan with other developing nations is a little optimistic. I am not questioning the truth of the accusations against Blagojevich did. To me what is interesting is the timing of this revelation (Blagojevich allegedly has Mob ties as well, but being a Governor from Ill. it is almost a pre-requisite :) ). So now all that talk about BoA is forgotten. I must ask if this was the case of taking Blagojevich down for stepping on the toes of BoA? People who attended the party (fundraiser) made it clear, anonymously, that Nayak brought them together to put his friend Congressman Jesse Jackson Jr.’s name up for the Senate. It had become clear that Senator Barack Obama would win the presidential contest to be held the next week, and these deep pockets realised that his elevation would open the Senate seat. The Governor of Illinois would have the right to fill the seat until the next election cycle. Nayak, Bedi, Bhatt and others wanted to put in a good word for their friend, Congressman Jackson. Gabhawala told Chicago Tribune that he saw Bedi and Nayak try to convince Babu Patel, a Blagojevich fund-raiser, to use his influence and money on Jackson’s behalf. The widespread public applause following last week’s arrest of the high profile Pakistani politician Asim Hussain was a timely reminder of the South Asian country’s popular yearning for a stepped up attack on corruption. Though granular details of the nature of the latest charges against Hussain remain a matter of speculation, it is clear that the charges eventually connect with energy related issues as Hussain previously served as the de facto minister of petroleum and natural resources. Though a medical doctor by training, Hussain rose to fame through his widely known proximity to Pakistan’s former president Asif Ali Zardari. In fact, he continues to be seen as one of Zardari’s most loyal political lieutenants. In sharp contrast to his training as a medical doctor, Zardari’s Pakistan Peoples Party (PPP) chose Hussain in 2011 to serve as its de facto minister. At a time when energy shortages across Pakistan were acutely visible, Hussain’s appointment attracted widespread interest and subsequent criticism. Ultimately then, many concluded that his choice for the job spoke more of the cronyism that has dominated Pakistan’s democratic politics in recent years, rather than merit. His arrest has been followed by news of the issuance of fresh non-bailable arrest warrants by a Pakistani court for the arrest of former prime minister Yusuf Raza Gilani of the PPP and former PPP minister Amin Fahim on corruption related charges. These three initiatives involving Hussain, Gilani and Fahim however must not be seen in isolation from Pakistan’s overall direction. In recent months, an army-backed campaign in the southern port city of Karachi to restore law and order, has also targeted members of the Muttahida Qaumi Movement (MQM) as part of a long overdue clean-up. The result has indeed been a marked improvement in Karachi’s daily atmosphere where robberies at gunpoint, purse snatching and mobile phone thefts were once a common occurrence. The PPP remains the other main political force in Karachi by virtue of ruling over the southern Sindh province of which Karachi is the local capital. It is important to note that the cases of the three PPP politicians highlighted last week on the face of it are the work of civilian agencies. Yet, a combination of conventional wisdom along side comprehensive analysis of Pakistan’s conditions clearly reveals the obvious handprint of the army led by General Raheel Sharif. It is clear that the Pakistan army is keen to oversee a long overdue attack on corruption. Clearly, the sudden pursuit of high profile PPP politicians by Pakistan’s anti-corruption official outfit, which for long remained complacent on the matter, has unleashed suggestions of mounting pressure from the army to push this process forward.